Jews live with miracles; for us, just living life is a miracle. Miracles constantly surround us. From the spectacular miracle which defies the law of nature to the unbelievably almost co-incidental miracle that happens within the bounds of nature, our existence as both individuals and as a nation has been based upon G-d's constant watch over us. From the amazing miracle of the splitting of the Red Sea, the Clouds of Glory during the day and Pillar of Fire at night that accompanied us for forty years in the desert to the mundane everyday miracle of our existent through the long and terrible exile among hostile gentiles we have constantly witnessed miracles. From an analytical point of view, there are three basic types of miracles. The most obvious is when the laws of nature are clearly suspended and a great action occurs, such as when G-d split the Red Sea and the Jewish nation walked on the dry ocean floor while the water stood upright on both sides as a straight wall. 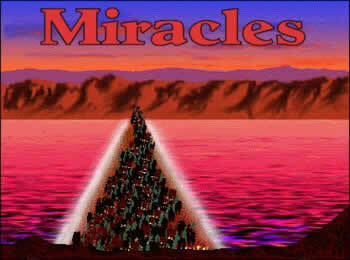 This type of miracle is clearly apparent and evident to every one. The second type of miracle is the daily mundane miracle to which we do not even notice such as our simply making a living or just driving home each day with out an accident. G-d is constant watching over us to help and prevent harm from reaching us. We are rarely aware of this kind of miracle since it is clad in nature; G-d hides His active participation from our eyes as we live our daily lives. Then there is the third type of miracle. This is the type in which we are in danger and yet almost miraculously we are saved. This type is like a car accident in which the driver normally would have been injured or even killed, but "somehow" escapes unscathed. We are obligated to thank G-d at all times. How much so when we have been in a dangerous situation and yet were spared from a tragic outcome. In olden times a person who had to travel through a desert or cross the ocean knew that his life was in constant jeopardy, and that he was at the will of nature. When he would come out from a danger like this he would thank G-d by blessing his name in front of a quorum of men. Today we do this in the synagogue. We make the blessing "Blessed are You, G-d, our Lord, King of the Universe, who bestows good on those who have sinned, for he has bestowed His goodness upon me." The reason we make this blessing is since a human king who saw a servant who was not truly faithful to him in a dangerous predicament would leave the servant to suffer. G-d who is truly good pays us good even though we are not totally worthy of it. On this goodness we thank G-d with that blessing. Those who hear this blessing respond: "May He who has bestowed His goodness upon you continue and bestow all of his goodness upon you." The meaning is that since G-d has shown some good to you, we add that He may continue to show you addition goodness. If an individual is in an accident and was miraculously saved from injury he must bless G-d for his kindness. How? Whenever that individual comes upon the place that the miracle occurred he should bless: "Blessed are You, G-d, our Lord, King of the Universe, Who did a miracle for me in this place." Even his children and grand-children are obligated to make this blessing. However if he sees the place regularly he does not bless only if he had not seen it in thirty days. Even for the mundane unseen and unknown miracles that G-d does for us constantly, such as helping us to make a living, navigating traffic, etc., or doing something of difficulty, we thank Him. However this is done differently. We recite our thanks in the "Modi'im" part of the Amida prayer (silent) that we say three times a day, "
These acknowledgements are an important part of our life. Through realizing that G-d is our active partner in life, we are drawn closer to Him. The more that we acknowledge this, the more He helps us to be able to see even more of His goodness. For this reason, it is the acknowledgement of the miracle which is much more important than the actual miracle itself.